In 1930, a farmer from Manchukuo was discovered among a traveling group of Chinese fakirs by a Russian employee of an American bank. Luckily, that man had a camera and sent a snapshot on to cartoonist and showman Robert Ripley of "Believe It Or Not!" fame. 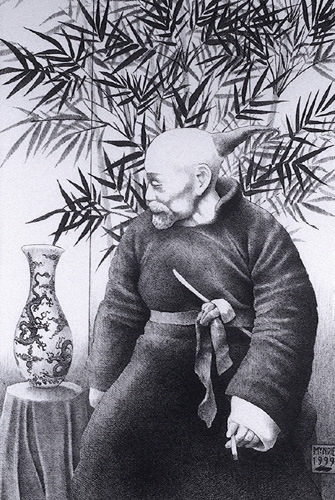 Known as Wang (or Weng), the farmer was normal in every respect except that he had a fourteen-inch horn growing from the back of his head. For this reason, Wang was christened by Ripley as "The Human Unicorn." Last seen in Manchuria, Wang disappeared from the public eye in the early 1930s, despite the large cash rewards Ripley offered to anyone who could find him again for an American appearance in Ripley's Odditorium. Here The Human Unicorn sits quietly enjoying a smoke and contemplating a porcelain vase.